Welcome to the studio website of James and Megan Holland. Here you can find information about our philosophy, our rates, our calendar and our bios. 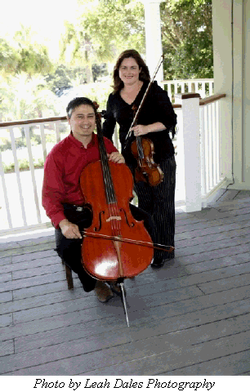 James is currently accepting cello students age 4 and older. Megan is also currently accepting violin students age 3 and older. We strive to create a supportive and nurturing environment for our students. Music study should be fun and interesting while helping each individual student reach his or her full potential. In addition to private lessons, students will have the opportunity to perform frequently. James and Megan teach out of their home on the West Side, which is located at 4805 Plume Rd NW, near Golf Course between Paseo del Norte and Montano. Megan is an Albuquerque native and James is from Pensacola, Florida. We perform regularly with groups all over Albuquerque and Santa Fe, including the Albuquerque Chamber Soloists, Chatter, and are both principal players with the Santa Fe Pro Musica orchestra.